KDD 2017, the premier interdisciplinary conference bringing together researchers and practitioners from data science, data mining, knowledge discovery, large-scale data analytics, and big data, is excited to be headed to Halifax, Nova Scotia! KDD 2017 will feature two adjacent and connected venues. International non-stop destinations to Halifax in the summer include London, Frankfurt, Munich, Dublin, Paris, Reykjavik, and Glasgow. United States non-stop destinations to Halifax include Boston, New York, and Newark. Local organizers suggest strongly that registrants reserve their flights as soon as possible. As August is the peak vacation season, the closer we get to the conference, the fewer the affordable travel options may be available. In addition, hotel rates quoted here are guaranteed until June 30 ONLY, beyond that date prices will be based on room availability. If you want to save money on lodging or transportation while attending KDD, use ConferenceShare to find attendees with whom you can share. We are listed as KDD 2017 on conferenceshare.co. Every taste, budget and group (big or small) can be accommodated with more than 70 restaurants and bars within an 11-block radius of downtown. If that’s not enough, there are over 500 throughout the city to choose from. Local specialties include cedar planked salmon, the freshest lobster in the world, Digby scallops and seafood chowder and much more. 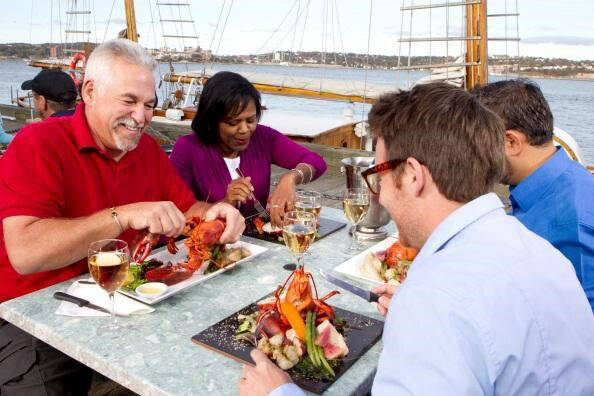 No visit to Halifax is complete without at least one seafood feast! For those with a more exotic palate, our local restaurants feature menus from around the world, including Japanese, Chinese, Indian and Thai food. You haven’t truly experienced Nova Scotia until you’ve enjoyed our locally brewed beers and award-winning wines. Within the downtown core there are four local breweries that offer seasonable flavours and local favourites. Prefer wine? Nova Scotia has 8 award-winning vineyard wineries around the province, many just an hour outside the city. Wine lovers will find the experience they’re looking for, and a chance to take home a taste of Nova Scotia – including Canada’s finest ice wine. Halifax is known for its vibrant nightlife and entertainment district. At the heart of the East Coast music scene you will find everything from fiddles and traditional Celtic music to alternative, rock, classical, jazz, blues and many variations in between. Spend any night of the week in downtown Halifax and you’re guaranteed to have a great time. If you’re looking for something a little different, visit one of Halifax’s dinner theatres or catch the latest offering from Neptune Theatre or Symphony of Nova Scotia. Local theatre options – Shakespeare by the Sea or the Eastern Front theatre – are also unique alternatives. Those looking for a taste of the Maritime heritage will enjoy Citadel Hill or explore the Art Gallery of Nova Scotia, home to the province’s art collection. Halifax offers many cultural attractions, too. Notable among these are the historic Halifax Citadel, the Art Gallery of Nova Scotia, the Maritime Museum of the Atlantic, the Canadian Museum of Immigration (Pier 21), the Museum of Natural History, and the Halifax Seaport farmers’ market. In 2015, Halifax will open the doors to a brand new, state-of-the-art discovery centre that will change the face of science in Nova Scotia. World-class architecture, breath-taking exhibits and hands-on learning experiences make the Discovery Centre a great place to escape for a few hours during a busy conference schedule and experience something new. The centre will be home to three unique spaces that will be the first of their kind in Atlantic Canada — an Immersive Dome Theatre, an Aquarium, and an Innovation Lab. It’s easy to find a Nova Scotian adventure in your unplanned moments. Downtown to out-of-town is a quick journey and you’ll find it quick and easy to get to other areas of our province. Discover Nova Scotia’s many scenic wonders with a journey outside the city to Peggy’s Cove or the Bay of Fundy for the day. Witnessing the beauty of our coastline firsthand is an experience you’ll treasure for a lifetime. The outdoor adventurer will enjoy hiking in the Cape Breton Highlands or the thrill of tidal bore rafting in the Bay of Fundy. Those looking for a more relaxed pace can explore our many local artisan shops and galleries, farmers markets, theatres, historic churches and museums, all situated in the picturesque towns of Lunenburg, Wolfville and Mahone Bay and many others – all just a short drive from Halifax.